Special performance Sat. Oct. 21 at 6PM + 8PM :: Multitudes in B Major - a new dance work. Like the ability of a memory to shift and be defined by the present, the imagery in The Echoing Green is perpetually in flux, culled from the artist’s mind but defined in the eye of the viewer. In a synthesis of inner and outer worlds, as landscapes dissolve into dreamscapes, the work in this exhibition concerns natural spaces both transitional and indefinable, remembered and imagined, of multiple dimensionality and time. In a Euclidean language, arcs of neon materialize from cement cylinders. The triangle, the semicircle and the rectangle, paired with geode fragments, act as abstracted symbols of imaginary places – combining a minimalist vocabulary with narrative. These mini monuments stand only inches tall yet have the ability to teleport. Through the sculpture’s geometric forms, you can take in an entire universe. Ruiz’s imagery originates in the exploration of fictional landscapes, informed largely by a love of science fiction. Her objects ultimately work to visually articulate an emotional state of mind, by applying her intimate understanding of neon technology with mathematical acuteness. Ruiz breaks with geometric order and embraces the natural world in her vividly hued plexiglass pools that call to mind magical aquatic bodies. When placed on the wall, these neon-rimmed Wells become wormholes or portals to other dimensions of time and place. Their emitted light throws color across the walls of the room, bathing faces, bodies and space. The appearance of light takes on a material presence, thus demanding not only a visual but also physical response. Equally inviting as it is enveloping, the neon draws the viewer in to know what is beyond the work’s reflective visage. The tactility and complexity of Tallmadge’s all-over, multimedia surfaces dissolve into an atmospheric sublime. Suggesting infinite states of mind and feeling, a viewing of one of Tallmadge’s sprawling works can be like plunging into a cloud, or being taken in by an exploding star. It is abstraction aestheticized and it is transcendent and romantic. Tallmadge expands the vocabulary of painting while simultaneously subverting it. Her paintings engage the history of Formalism – most notably the point-of-view of color field painting – and the politics of beauty and surface. Utilizing materials such as mica, silver leaf and glitter, Tallmadge sets a dialogue between external sources in urban and natural environments with a more internal process of making. 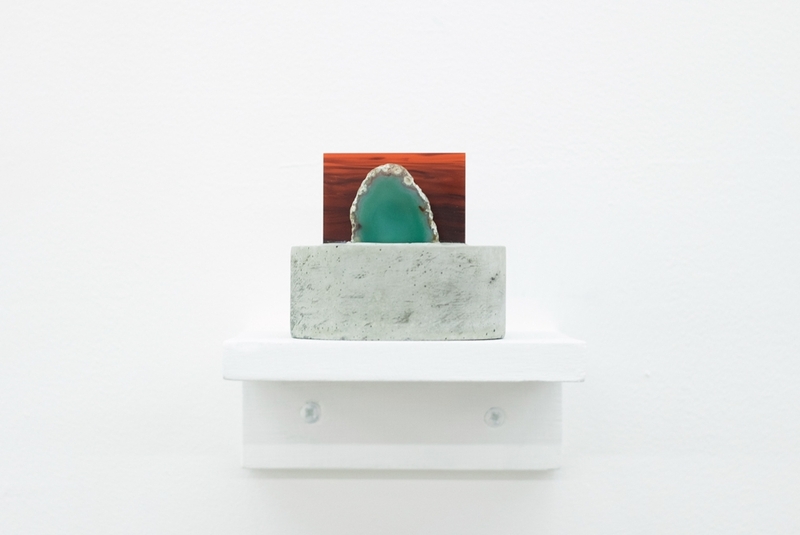 The smaller-scale works read as artifacts of a geological time. At once speaking to something earthly – recalling processes of growth and decay – they are also completely otherworldly, lending an exquisite duality. The exhibition shifts from maximalist back to minimalist with Romero’s visual lexicon of earthly forms. In a pursuit to extract from nature in its truest form, as one experiences it, Romero pulls from the imprints made on the psyche – both visual and visceral – through her hours steeped in the natural landscape. [Romero’s innate understanding of organic forms is furthered by her studies in environmental science, with a specialization in sustainable agriculture.] Here, Romero’s abstracted, organoid forms are reduced to their essence by an automated stream of consciousness, resulting in beautifully unworked, floating compositions. When viewed as a series, the works on paper echo the acute variability of nature’s own formal language - its index of simplified forms, generated by means of infinite variation. What is also discretely distinct is nature’s mysterious element of calm. At once emphatically flat while implying unbounded, limitless space, Bania’s shifting transparant planes delve into the spatial possibilities of the picture plane. Every element is exactly where it has to be, not where it happens to be, to create interplays of spatial flux. The works explore the abstract geographies that we navigate, in waking hours and in dream. Each painting begins as a field of space from which an environment arises. As the space is acted upon, a conversation ensues between materiality and immateriality, emptiness and fullness, stillness and movement, objects seen and energy felt. The compositions that emerge are built from these contrasting forces.